Alepuz, S.; Busquets-Monge, S.; Bordonau, J.; Martinez, J.; Silva, C.; Pontt, J.; Rodríguez, J.
Low-voltage ride-through (LVRT) requirements demand wind-power plants to remain connected to the network in presence of grid-voltage dips. Most dips present positive-, negative-, and zero-sequence components. Hence, regulators based on symmetrical components are well suited to control gridconnected converters. A neutral-point-clamped topology has been considered as an active front end of a distributed power-generation system, following the trend of increasing power and voltage levels in wind-power systems. Three different current controllers based on symmetrical components and linear quadratic regulator have been considered. The performance of each controller is evaluated on LVRT requirement fulfillment, grid-current balancing, maximum grid-current value control, and oscillating power flow. Simulation and experimental results show that all three controllers meet LVRT requirements, although different system performance is found for each control approach. Therefore, controller selection depends on the system constraints and the type of preferred performance features. Alepuz, S. [et al.]. 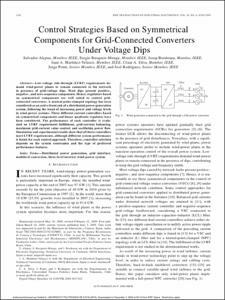 Control strategies based on symmetrical components for grid-connected converters under voltage dips. "IEEE transactions on industrial electronics", Juny 2009, vol. 56, núm. 6, p. 2162-2173.